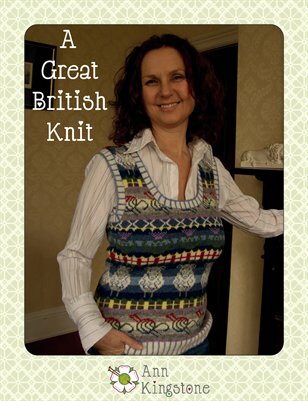 This lovely scoop neck vest with side shaping features sheep, needles and yarn, a choice of national flowers (roses, thistles, daffodils, or shamrocks) and flags of the patron saints of Scotland, England, Wales, and Northern Ireland. The vest/tank top is a seamless, bottom-up knit. It includes steeks for armholes and neck openings, and short row shaping at the shoulders. Tutorials for many of the special techniques involved may be found at my website.